Discount retailer Aldi plans to invest €100m in Ireland over the next three years as it seeks to increase its footprint. The company aims to add around 20 new stores which will create 400 new jobs. “Our business model is pretty simple. There’s not a hugely complex strategy. We want to make a store available to everybody in Ireland. Our belief is that by doing that we’ll continue to develop our sales and our market share,” Giles Hurley, the head of the company’s Irish operation, told the Sunday Independent. Aldi has 11.3pc of Ireland’s intensely competitive grocery market, according to the latest figures from researchers Kantar Worldpanel. 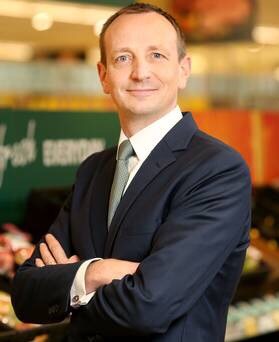 That makes it the fifth-largest supermarket in Ireland, 0.1 percentage points behind rival Lidl. After rapid increases in market share between 2008 and 2014, the company’s growth in that metric slowed somewhat – it has the same percentage of the market as it did in the 12 weeks to March 29 of last year, having dipped as low as 10.3pc in the intervening period. “We’re not really focused on market share as a goal or metric, it’s an outcome of developing our sales,” Hurley said. The value of Aldi’s sales grew 6.6pc year-on-year in the 12 weeks to November 6, 2.4 percentage points ahead of the average figure. It is set to open new stores in Trim, Co Meath, Leixlip, Co Kildare, and Ennistymon, Co Clare and is looking to secure planning for outlets in Dunshaughlin, Co Meath and Graiguenamanagh, Co Kilkenny, Hurley said. “I’m estimating 20 [new stores] over the next three years which should comfortably mean that we deliver another 400-odd jobs to add to the 3,200 people that we currently employ in the Republic of Ireland. “There is, I would say, a big opportunity in the big metropolitan areas of Dublin, Limerick, Galway, Cork, where we feel there’s lots of customers who can’t easily access one of our stores. Hurley said the company sees itself as a “broad church” retailer that wants to service shoppers seeking value as well as those who want to indulge. Posted on December 6, 2016, in #ireland, #retail. Bookmark the permalink. Leave a comment.